Wellness providers, teachers and non-profit organizations can purchase this multi-media practice guide for students, patients and clients at a bulk discount price of just $5.50 per guide. Available in lots of 20. NOTE: Shipping services are currently in transition. To place an order for this product, email suzanne@mindfulyogatherapy.org. Wellness providers, teachers and non-profit organizations who wish to offer Mindful Yoga Therapy to those they serve can now purchase the practice guide at 70% off the retail price by ordering in lots of 20, at a cost of $5.50 per guide. 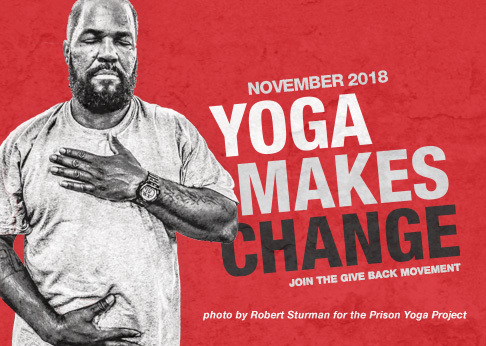 Developed through practical and clinical experience in working with veterans recovering from post-traumatic stress, the Mindful Yoga Therapy program shares simple but effective yoga practices that offer real benefits to students. Read what veterans and instructors are saying about Mindful Yoga Therapy. Each multi-media practice guide includes a book, a supplementary poster with a visual guide to 61 poses, and download links for two audio resources featuring breathing practices and yoga nidra. Please note a bulk shipping charge applies. Non-profit organizations: Give Back Yoga Foundation’s federal TIN, VACT vendor number and DUNN number are available on the About Us page. Shipping services are currently in transition. To place an order for this product, email suzanne@mindfulyogatherapy.org. Just need a single copy? Order one Mindful Yoga Therapy practice guide at retail price, and help us to fund three free copies for veterans and military personnel.